Welcome to "The Grand Family Beach Condo". We are so blessed that God has given us the opportunity to enjoy The Grand Family Beach Condo. Our family wants your family to also share in our blessings. The condo is furnished and setup to host large families or multiple families at one time. Please feel free to contact us with any additional questions you may have. Edgewater Golf and Beach Resort is a great resort that is well maintained with a beach resturant, tiki bar, pizza parlor, ice cream shop, Starbucks, tennis courts, golf course, gym, and all in a gated resort with security cameras monitoring every where. You also have so many attractions and resturants just minutes outside the resort. We also have a Facebook Page: "The Grand Family Beach Condo" This page also has many more photos of the resort and our condo. Look forward to hearing from you!! 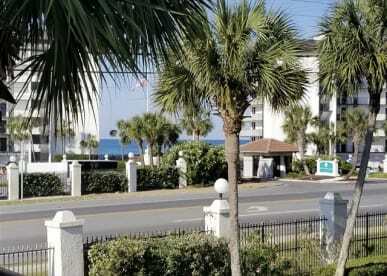 The Grand Family Beach Condo is located in the Edgewater Beach & Golf Resort. Edgewater Resort amenities will be sure you and your family have the best vacation ever. The resort offers eleven pools, four Jacuzzis, a shuffleboard court, six tennis courts, nine holes of golf and endless Florida sunsets. Enjoy parasailing, jet skiing, tennis, golf, weight lifting, beach yoga or a soothing body wrap. The Resort will be sure you and your family have the best vacation ever...until your next visit, that is. During your stay at Edgewater Beach & Golf Resort, take advantage of all the activities available on the sugar-white sands of Panama City Beach right outside your door. Relax by the Lagoon Pool, parasail over the emerald green waters of the Gulf of Mexico, indulge your senses with massage services at Bellas. Whether it’s golf, sunbathing, or fine dining you’re looking for, you will find it here.